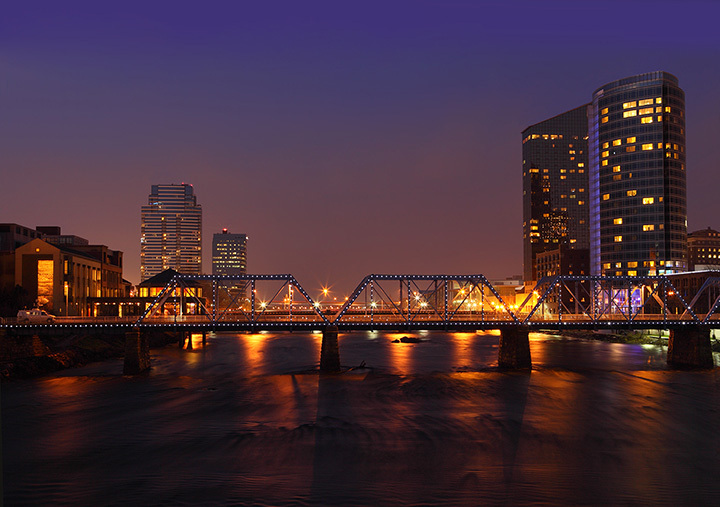 The second largest city in Michigan, Grand Rapids is a beautiful and historic city with plenty to explore. Whether you’d like to learn more about the city at a local museum, visit a magnificent sculpture park or grab a delicious bite to eat, there’s a lot to see here. Check out the 10 best things to do in Grand Rapids, Michigan! Did you know the building now housing the Grand Rapids Public Museum started life as a flour mill? It's come a long way since then, and now you can get a spectacular education all in that one building. Check out the virtual reality exhibit about the museum's finback whale skeleton known as Finny. Get up close and personal with two live lake sturgeon. Take a ride on the 1928 Spillman Carousel. No matter what you do, come ready for an exciting and informative experience! Looking for some fresh air while you're in Grand Rapids? The Frederik Meijer Gardens & Sculpture Park is waiting for you. Whether you want to check out plants or art, you're definitely covered here. But there's plenty more than that waiting for you here. The gardens are world-famous for their annual concentrations of butterflies—it's home to the largest temporary tropical butterfly exhibition in the United States—and a host of exhibits from the family-fun to the artistically inclined will be on hand for you to enjoy. Want to be outside but with more action? Check out John Ball Zoo, where your taste to check out animals of all sizes and shapes will be accommodated. From tigers to penguins to pelicans and most everything in between, you'll get the full range of options here. It's not just wandering around and looking at animals, of course, as there will be several places for the younger set to play or even interact directly with some of the animals. If you're looking for some more adrenaline-pumping thrills, check out Grand Rapids Treetop Adventure Park. Zip lines, rope climbs, and courses of a wide range of skill levels will be waiting for you here. Start with the simple five-element course and work your way up to a series of challenges 40 feet off the ground, trying out everything from the tight wire walk to the wrecking ball ride. The largest outdoor stadium in West Michigan, Fifth Third Ballpark is home to events throughout the year, nearly 200 of them at last report. Home of the West Michigan Whitecaps, it's a great place to take in a game, or check out one of the concerts that runs in the area. It's also home to the Fifth Third Burger, a cheeseburger of impressive dimensions—it’s one and two-thirds of a pound—that was once featured on Food Network. Operating since 1999, Craig's Cruisers is one of the biggest names in go-karts Grand Rapids can offer, and well beyond as well. Featuring laser tag and a full arcade, as well as a slate of outdoor attractions and a complete 25,000-square-foot restaurant—coming soon, a complete if compact roller coaster—there's no end of exciting things to do there. Best of all, it prides itself on offering “family entertainment in a clean and safe environment,” so no matter who you're bringing along, you should be in good hands. Not only is this part art installation, it also serves a useful and environmentally-sound purpose: it's used as a means to allow migratory fish a way to get up the Grand River without having to navigate the rapids contained therein. So you can effectively watch fish jump up the “fish ladder” in question, making this a popular attraction during fish migration seasons. Kcymaerxthaere is described as a “parallel universe that includes in its embrace our linear world,” of which Grand Rapids is a part. It's actually a global art installation, and Grand Rapids hosts five pieces of it, marked by plaques that tell part of a story. Check out Erailen Gwome, Forest's Rest, Grwostlaven, Handfuls of Small Stones, and Waiting for the Grwost throughout Grand Rapids. One part location, one part event, the Great Lakes Pub Cruiser is a 15-person party bike that is completely powered by its patrons. Get together a group, or join another, and pedal this vaguely bar-shaped bicycle around Grand Rapids, making the theme of your tour whatsoever you wish. Make it the vehicle of choice for a bar crawl. Take a run at some local eateries. Focus on ice cream. Whatever you like, you and your party will be able to hit up as much as you can in the two to three hours your tour on the Pub Cruiser will last.